Almost four years ago, we designed and built a new website for The Granada (Granada). The website was built in WordPress and included a custom theme. 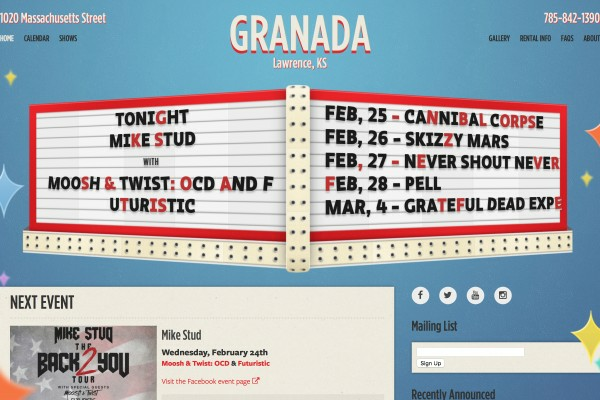 A few months ago, the Granada was interested in making some updates to their website. Before making any updates, we converted the website from WordPress to our latest development systems which include Laravel, UIkit and LaraManager. This posts talks a little about the conversion. A few years ago, Philsquare started working with a PHP framework called Laravel. We currently use it on most of our new projects. In this post, I discuss the events that led us to use Laravel and how and why we use it. Owning a website usually means you need 3 services. These are website host, domain registrar and an email host. Most major web hosting companies provide all 3 services. However, you don’t have to rely on one company to provide each of these services. For example, at Philsquare we prefer Google for handling our email services so we use them instead of our hosting company, Media Temple. However, this requires another set of credentials (login information) to track and we pay additional costs. To get a better understanding of these 3 services, let’s talk about them individually.